It's another one of those albums where I had no idea what was coming. Well, I had some idea, but it was buried so deep in my "music to get" txt file that I could barely remember. Lo-fi pop, I think I thought. Folk. Well, I was almost right. 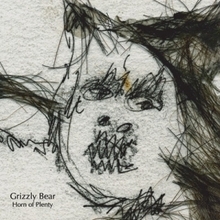 Grizzly Bear has a cool thing going on - their music is relatively simple, but subtle and very good. They remind me of Parsley Sound first, in their hushed Simon and Garfunkel-esque vocals. Then it's like a shot of the Shins' first album, but furry and de-jangled. Lastly, there's a hint of the naive brilliance of Remora, whose simple melodies couldn't be called accomplished, but whose essential knowledge of making compelling music is unquestionable. I might even throw a little Kallikak Family in there, just to make a sort of hipster four-play. There's an experimental quality to the music as well; for example, "Alligator" has the distorted, unearthly sound of Black Moth Super Rainbow, and the vocals of "Disappearing Act" and "Showcase" tread where Elliot Smith only dabbled. The songwriting is hit-and-miss, to be honest. For every sure thing like "Don't Ask" there is a misstep like "Fix it," where you see where they were going but you can tell they didn't get there. While I understand the members of the band to be pretty accomplished, the music is far from technically good. The bulk of the harmony is created by multitracked vocals, which can be great but can't always create the right sound for a song. In any case, since I'm so far behind the times, I look forward to stepping right into these guys' newer releases; perhaps they've smoothed out the hiccups in the last couple years. I guess there is also a set of remixes out there, though I don't see this music lending itself too well to any new mixes. Still, this is a great album and even if you don't like the whole thing, there are some songs that are too good to pass up. Here are the first two. Here's "Deep Sea Diver" and "Don't Ask," by Grizzly Bear. whats that avatar??? flash or what??? I might even throw a little Kallikak Family in there, just to make a sort of hipster four-play. There are so many Viagra side effects that they cannot be ignored. Some of the Viagra side effects are not as serious as others, but the fact is they are still worrisome and inconvenient. If you are taking Viagra and are experiencing any side effects, it is advisable that you stop taking it and speak to your doctor. Grizzlt also live in Alaska I seen them personaly. Hello there, I am looking for an upcoming music director indian male/female, but before that let me clarify no money is involved in this. Its just that i keep on writing a few poems, songs etc and i just need somebody to mould those words into a heart touching & unique composition. I will then publish it on the internet and publicize it by his/her name and lyrics will be mine. I do not want anything out of it especially money coz i have enough to satisfy my needs. Can a music education student teach only music history in the schools upon completion of a BME? I am a music education student and really enjoy music history, or as it is now known as musicology. I want to know can I teach only Music History in the public schools (Or be a clinican) to the public schools in Music History?. How can I go about this?. I would appreciate advice from a music teacher in the public school system or other music teachers. No jokes, serious only please. Thank you. It doesn't matter is the rainbow is on a poem, a cake , a draw in the wall, in our hair , in the sky or in any other place is always beautiful to see all those colors. Excellent news , I really like this write! I enjoy it so much! I hope you give me more interesting topics to read on. Thanks for give me a good reading moment! their hushed Simon and Garfunkel-esque vocals. Took me time to read all the comments, but I truly enjoyed the write-up. It proved to be Very helpful to me and I am positive to all the commenters right here It is always great when you can not only be informed, but also entertained I’m sure you had fun writing this article. I myself is too scared to get in front of these giants. Camping is fun, but you should also be aware of these bears coming after you. It's funny how we adopt words and adapt our lexicon to the times. This is a very useful slant on things. Couldnt agree more with that, very attractive article. Milan is a location of contrast and culture, poverty and incredible wealth and thus you'd imagine that it is similar to another main City however then should you did that you would be wrong - Milan is different.Rome is a magical place! A Metropolis that has the current and the past elegantly standing shoulder to shoulder and of course which makes Rome a good destination for any visitor.